I started playing the piano aged nine, completing grades 1-8 before going on to study classical music at the University of Leeds. 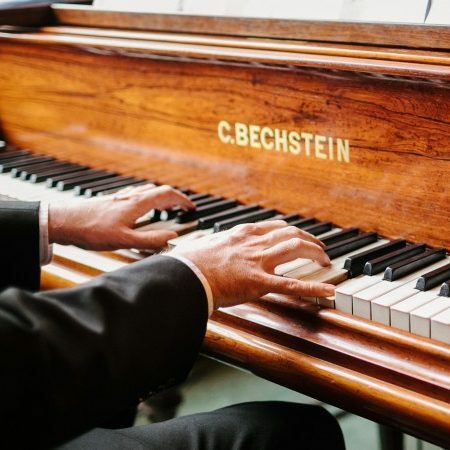 These days I split my time between teaching students privately with work in schools as an accompanist and performance work, playing for weddings and corporate functions. I love my career, no day is the same as everyone learns differently. I’ve been teaching for 12 years and enjoy tailoring lessons to students of all ages and interests. As I learnt to play without music I understand what it is like to play by ear, therefore alongside traditional teaching through sight reading I also teach students to play without reading, developing skills such as improvisation and composition. Playing by ear, as well as reading music. If studying for an exam, we regularly have practice exams and pieces are marked with feedback so they have a clear understanding of how to progress and successfully prepare. We also cover scales and arpeggios, notation and theory and sight-reading practice. Learning to play the piano doesn’t just mean learning classical music. I enjoy nearly all music, everything from Chopin and Bach, to Radiohead and the Beetles and adapt music from all genres for solo piano. This means as a beginner you can immediately start learning the music you want, making practice much more enjoyable. I’ll adapt music to your level of experience, meaning you have something to get your teeth stuck into early on. You can check out a few of my favourite songs on my youtube channel. I currently work with a dj in Huddersfield composing dance music and in doing this have developed new ways of making different styles of music sound good on the piano. If you’re the type of person who likes to work towards specific goals, and to receive official recognition of your ability to play at a certain level, then going through graded music exams might be something you would enjoy. Equally, I teach other students who would rather learn the piano without taking this step, preferring to learn the music of their choosing and develop playing by ear alongside reading music. Either way is fine by me. I possess a full DBS certificate and teach from home where I have a purpose made music room. Friends and family can sit on the lesson and there is also a dedicated waiting area. My piano is a 1960s Knight made in Britain, I also use a Casio Privia electric piano for those who wish to play keyboard. 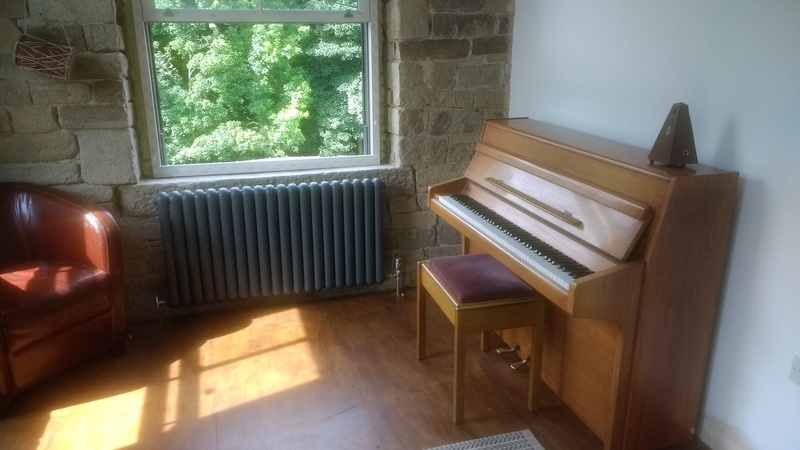 Piano teaching room near Luddenfoot, Halifax. I teach piano lessons from home – Luddenden, Sowerby Bridge, Mythomroyd, Hebden Bridge, Brighouse and Elland, Halifax and further afield in Bradford & Huddersfield. Home is a place called Jowler, located between Wainstalls, Mount Tabor and Luddendenfoot. I live with my fiancé and baby, teaching from home most evenings. We are approximately 10 minutes from Halifax, Mythomroyd, Sowerby Bridge and Hebden Bridge. Brighouse, Elland, Ripponden, Haworth, Todmorden and Bradford are not far away. Each year all students have the opportunity to perform in a piano recital at the Square Chapel in Halifax on a Steinway D Grand piano. This is ideal preparation for piano exams or any other type of public performance. The concert is not a competition, it offers a friendly environment in which people have the chance to show friends and family (and 100 or so other spectators) what they’ve been learning in their lessons. Students love it and find it really helps motivate them.